When a loved one ended up in physical rehab after a fall, I quickly learned what a bummer nursing homes can be. Although the staff tried to maintain a cheery atmosphere, it was clear that if my relative, Marion, stayed on as a permanent resident, she wouldn't be having much fun — and she'd be paying more than it would cost to live in the Four Seasons. This is why so many families look to assisted living as an alternative to a nursing home for elders who can't live independently but don't need extensive medical support. Nearly a million Americans now reside in assisted living facilities, and that number has grown substantially in recent years, according to the Centers for Disease Control and Prevention. Assisted living facilities are able to charge less than nursing homes because they need less medical staff, and many offer activities and social opportunities far beyond what residents can find in nursing homes. Depending on the number and qualifications of staff, some facilities can help patients transfer from a wheelchair to bed or to the shower, while others can only accept residents who can transfer themselves, or at least help. Some facilities have locked memory care units for patients suffering dementia, but others don't. Before investigating further, find out whether your loved one could qualify to live there. 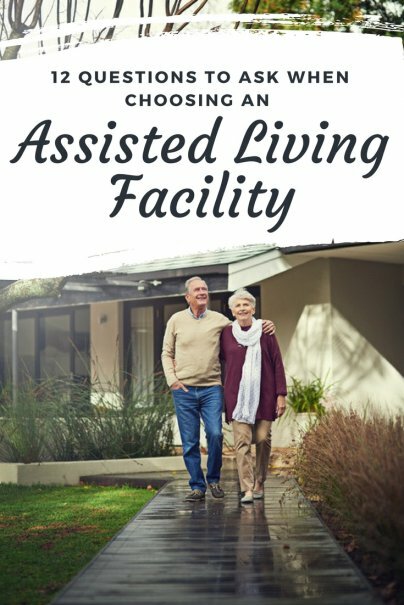 The assisted living management may send a representative to evaluate the potential resident. If your loved one doesn't qualify, ask if there is anything they could do to improve their chances. In our case, Marion was close to the level of self-care needed but was lacking some abilities, so she did additional physical therapy before being re-evaluated. Beware of facilities that are so anxious to fill rooms that they accept residents they shouldn't. Make sure you ask exactly what help the residents get and what they don't. Find out what the staff to resident ratio is, including during the night shift. They may say they can help residents get up at night, but if one staffer is responsible for 100 residents, it's probably not happening. These facilities are regulated by state, so check with yours to find out the place's record. In California, you can look up a facility's license status, any citations or complaints, and view inspection records online. Other resources to check are the Better Business Bureau and your state's ombudsman. Once she was settled in her assisted living facility, Marion enjoyed wheelchair fitness classes, bingo games, church services, and other activities. Later, she moved to a memory care unit that offered activities with more direction, such as arts and crafts and cooking classes. If your loved one is active, you'll want to look for a place that offers field trips and maybe even cocktail hours. A more limited person may be content with offerings such as taking some sun on the patio. It's important to find out in advance under what conditions the resident could be involuntarily discharged. Sadly, after a hospitalization, Marion was not allowed to return to the assisted living facility she loved because her self-care abilities had declined. Luckily, we were able to place her in another facility with a higher level of care. The new facility was more expensive, but not only was it better equipped to care for her, the management promised — in writing — that under most circumstances she would be able to stay for the rest of her life. When the time came for hospice care, it was provided right in her room, where she felt most comfortable. If your elderly relative is still mentally nimble but needs help with physical needs, it's important to make sure they'll have peers in their new home. You can ask management about this, but it's one of the things you'll probably notice on a tour. Engage any residents in common areas in conversation to see if they seem willing and able to socialize with your loved one. The best facilities sometimes have waiting lists. Before either you or your loved one gets too set on a specific place, find out if there is a waiting list for the type of unit they want. If there is a long wait, consider where they will be living in the interim. If at home, is it safe to wait that long? If in a nursing home, consider that the longer someone stays in a situation that isn't right for them, the more their physical and emotional state can deteriorate. It's never easy to watch a loved one lose independence. But when the time comes, asking these questions can go a long way toward smoothing the transition and making sure they are in the right place.